Background: Measurement of for near point of convergence (NPC), amplitude of accommodation (AA) and phoria are important components of diagnosing nonstrabismic binocular vision anomalies. There is a huge variation in the normative data established for orthoptic parameters because of the variation in measurement technique. There are only limited studies for normative data based on nonclinical population in Indian population. Therefore, we aim estimate the normative values for NPC, AA, and phoria measurement in Indian population using techniques, which has good repeatability and reliability. Materials and Methods: Subjects between the age group 10-35 years participated in this prospective cross-sectional study. A self-administered symptom questionnaire was used to exclude patients with asthenopic symptoms. Clinical techniques which have good repeatability and reliability were used. NPC was measured using pen light red, green glass test. AA was measured using minus lens technique. Horizontal and vertical phoria at distance and near was measured using modified Thorington method. Results: One hundred and fifty subjects participated in the study. We found that NPC receded with age, which could because of the increase in horizontal phoria at near with age. The mean normative value for objective NPC, break and recovery of subjective NPC, monocular and binocular AA, horizontal and vertical phoria at distance and near for the three age groups are reported in the study. Conclusion: The data presented in this study can be used as a cut-off by eye care practitioners while diagnosing convergence, accommodation related anomalies in Indian population. Evaluation of convergence, accommodation and phoria is an important component of comprehensive eye examination in the diagnosis of a wide range of binocular anomalies. Several studies provide normative values for binocular function in different populations. , There are only limited normative data available on binocular function for large nonclinical population. The normative data for orthoptic parameters reported by Scheiman and Wick  have been used worldwide as guidelines to diagnose and to make clinical decisions on the treatment of binocular anomalies, and it is based on Caucasian data. There is also a huge variation in the normative data based on the technique used. 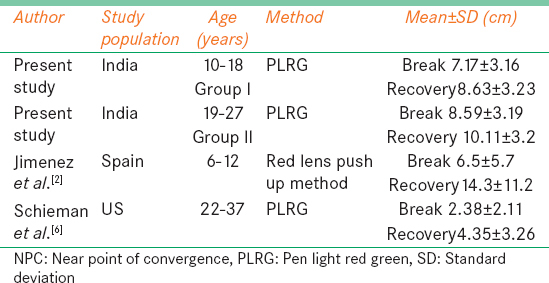 Therefore, there is a need for establishing normative data for orthoptic parameters in Indian population across various age groups using clinical techniques which have good repeatability and reliability. This prospective cross-sectional study was conducted according to the tenets of the Declaration of Helsinki. This study was approved by the Institution Research and Ethics Committee. Subjects between 10 and 35 years were recruited for the study. Written informed consent was obtained from for all the subjects above 18 years of age. For subjects below 18 years, the written consent was obtained from the respective school in charge. A symptom survey questionnaire was administered to all subjects. Shortened version of Convergence Insufficiency and Reading Study group questionnaire was used. Subjects who had a score ≤12 in this questionnaire, best corrected visual acuity better than or equal to 20/20, N6 and with a refractive error of ≤3.00 D of myopia/hyperopia and ≤1.50 D of astigmatism were only included in the study. Subjects with any ocular pathology, systemic illness, previous treatment for binocular vision anomalies, anisometropia were excluded. Subjects were categorized into three different groups based on age. Groups I, II, and III included subjects of age ranged from 10 to 18 years, 19 to 27 years, and 28 to 35 years, respectively. The symptom questionnaire had totally eight questions. The response was based on a three-point scale as never, sometimes, frequently and a score of 1, 2, and 3 were given to it respectively. Maximum and minimum total score that can be obtained is 24 (very symptomatic) and 8 (no symptoms). Hence, a cut-off value of <12 points was considered as inclusion criteria for this study. For all subjects near point of convergence (NPC), amplitude of accommodation (AA) and phoria were measured. Procedures which had good repeatability and reliability to measure NPC, AA and phoria were reported to be pen light red green (PLRG) method,  minus lens method,  and modified Thorington method,  respectively. Objective and subjective NPC was measured. Objective NPC was measured using accommodative target in Beren's ruler. The examiner moved the target toward the patient's eye and stopped it when a deviation in one of the eye is noted; the distance from this point to the lateral canthus was measured. Subjective break and recovery of NPC was measured using PLRG method. Red glass was placed before right eye and green glass was placed before left eye. A pen torch was brought from a distance of 50 cm and moved towards his/her Nose Bridge. Subjects were asked to respond to the point at which two separate color lights were seen (i.e., red and green) and that point was recorded as break. Then the pen light was moved away from the subject and was asked to report when two light become single. This was recorded as the recovery point. NPC was repeated thrice for all subjects. Both objective and subjective NPC was measures thrice and average was taken. Monocular and binocular AA was measured using minus lens method. Subjects were asked to fixate on N8 target at a distance of 40 cm. Then minus lenses were introduced in 0.25 steps until the patient reported first sustained blur that cannot be cleared by further conscious effort. This procedure was done monocularly (for right and left eye) first and then binocularly. Total AA was estimated as the sum of the endpoint minus lens and accommodation necessary for the target at 40 cm (2.5 D). Horizontal and vertical phoria for distance and near was done with modified Thorington technique. This technique is the subjective method of evaluating the presence, direction, and the magnitude of phoria. The cards were calibrated for distance testing at 10 feet and near testing at 16 inches, with best corrected refraction. A Maddox rod was placed over the subject's right eye with the grooves oriented in the appropriate direction to measure either horizontal or vertical phoria, respectively. The modified Thorington card was placed at appropriate testing distance and a torch light was shown through the center of the card. The subject had to report the number through which the red line passes; this gives the magnitude of the phoria. The direction of phoria was noted depending upon the position of the line as up, down, left or right with respect to the central zero point in the Thorington card. All tests were done in the same sequence for all subjects. The data were analyzed by the statistical package SPSS 16. Descriptive analysis was done. Normality distribution was assessed with Kolmogorov-Smirnov Z test. To compare variation across three groups either one-way ANOVA or Kruskal-Wallis was done depending upon the distribution of data. Repeated measures of ANOVA were done to compare the variation in the repeated NPC measures. Paired t-test was also done to compare the monocular and binocular AA, subjective and objective measures of NPC. The demographic details such as age, gender distribution, and symptom scores of the 150 subjects with 50 in each group are given in [Table 1]. 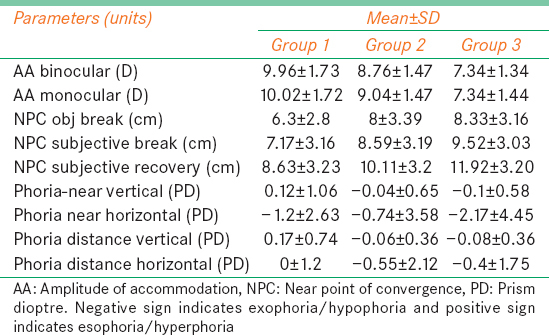 The mean and standard deviation (SD) of variables such as monocular and binocular AA, objective and subjective NPC (break and recovery), distance and near phoria (horizontal and vertical) are given in [Table 2]. 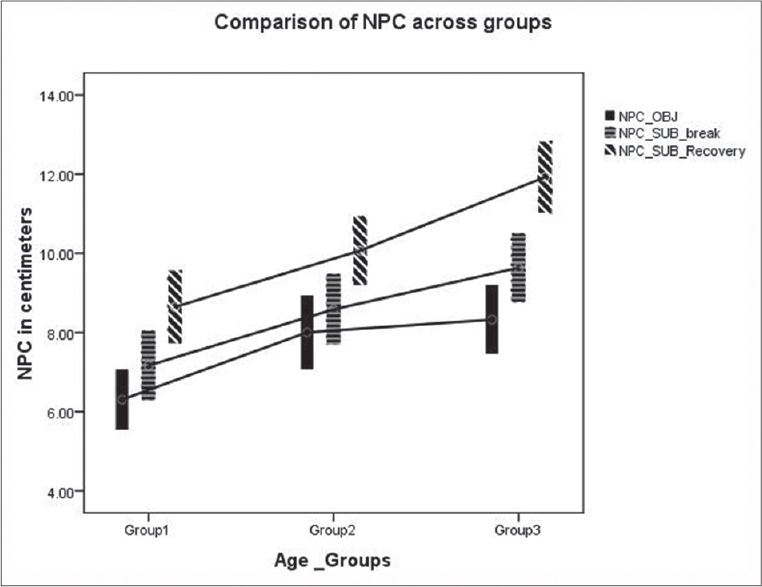 One-way ANOVA was done for all parameters that were normally distributed to compare the variation of parameters across the three different age groups [Table 3] shows the results of NPC and AA varied significantly across all the three age groups (P < 0.05). Post hoc Bonferroni test was used to compare measures between the three different age groups. The test showed variation between all groups for both monocular and binocular AA [Figure 1]. The test showed that variation in objective NPC break (P = 1.000) and subjective NPC break (P = 0.421) was not significantly different between Groups II and III. Similar observation was noted for subjective break (0.074) and subjective recovery (0.066) between Groups I and II [Figure 2]. Paired t-test was done to compare monocular and binocular AA measures in each group. It was significantly different only in Group II (P = 0.001, 0.32 ± 0.64 D, 95% confidence interval (0.13, 0.50) [Figure 1]. Similar analysis was done to compare objective and subjective NPC break values in each group. It was significantly different in all the three groups (Group I P = 0.00, Group II P = 0.045, and Group III P = 0.004) [Figure 2]. Kruskal-Wallis test was done to analyze the variation across groups for phoria measurements and symptom scores since it was not normally distributed. There were significant variation in scores across all the three groups (P = 0.00) and horizontal phoria at near (P = 0.017) [Figure 3]. This study showed that both monocular and binocular AA decreased with age, and there was no significant difference between monocular and binocular AA. This could be because the plane of convergence was not changed in minus lens method. In 1912, Duane  reported that the AA is higher in young ages. Berens and Sells  studied that in young ages the accommodative system is flexible and resistant to fatigue. Though these are old data, they are predominantly used as normative for ocular accommodation. Our normative data is similar to the data suggested by Eskridge et al. for all the three age groups since a similar technique was used. AA in our study showed slightly lower values across all age groups compared to the data given by Donders and Duane's. , Using Hofstetter's  equations expected AA for Groups I, II and III were found to be 14.6 D, 11.9 D, and 9.5 D, respectively. However, this study showed a lesser mean value such as 10.04 D, 9.04 D, and 7.34 D for Group I, II, and III, respectively. This could be because of the difference in technique used. This study showed that NPC receded with age, but the difference was not significant between Group II (19-27 years) and III (28-35 years). There is no comparable data available for objective NPC. [Table 4] compares the NPC break values from this study in the age group between 10 and 18 years were similar to Jiménez et al.,  but the recovery values differed. Similar results were also reported by Capobianco  For the age group between 28 and 35 years this study showed receded NPC for break and recovery when compared with study done by Scheiman et al. which was done in US population even though similar measurement techniques were used. For Group II our mean and SD of NPC break 10.11 ± 3.2 differed from study done by Rouse et al. in which he reported a cut off value of 5 cm. This variation could be because of the difference in technique used. Symptomatic patient's shows a greater recession in the NPC with repeated testing compared with normal. This study showed that there is no significant difference in break and recovery on repeated testing since the subjects were normal. 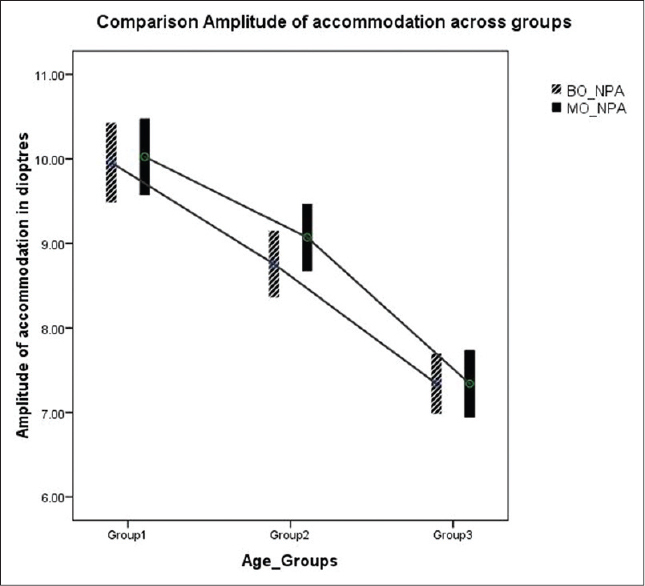 In this study, only horizontal phoria at near showed a significant increase with age, especially in the Group III (28-35 years). This could be a factor adding to cause of receded NPC with increasing age. [Table 5] compares phoria measurement with other studies. In the younger age group (6-12 years), more amount of exophoria for near was observed in our study population as compared with Jiménez et al. Lyon et al. have reported normative values similar to our study for the Group I. 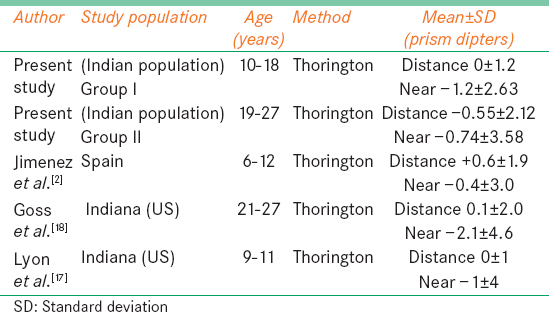 In the age group between 21 and 27 years our data on phoria had a similar trend like the study done by Goss et al.,  but their population had more exophoria for near. Since similar measuring technique was not used by other studies, no comparable data was for available for Group III. A study  done in South African population for the normal range of heterophoria has also showed there is wider distribution of near horizontal heterophoria (2.5 exo ± 2.37) than at far (0.2 exo ± 1.17), which was even seen in our study in all age groups. 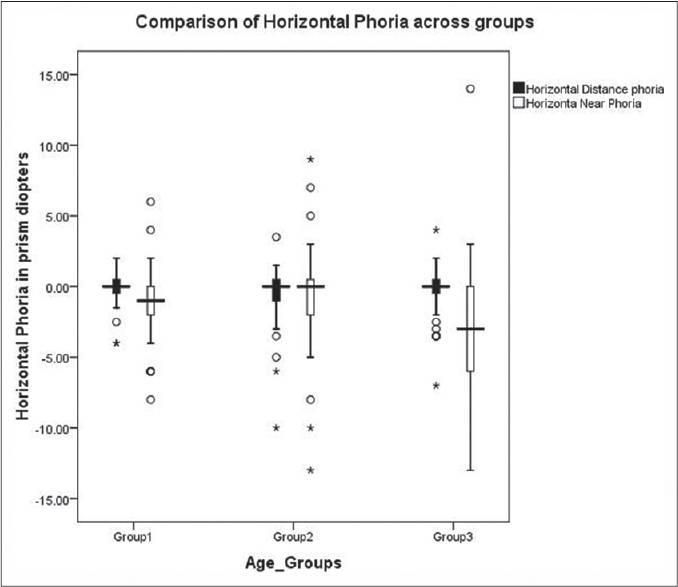 From our study, we find that the vertical phoria was not significantly different for distance and near for all age groups. The normative data for AA, NPC, and phoria were slightly varied with the normative of other population where similar techniques of good repeatability were used. The variation was high if a different technique was used for measurement. The normative data for monocular and binocular AA, objective and subjective NPC (break and recovery), distance and near phoria (horizontal and vertical) reported in this study can be used as a reference value in the process of diagnosing accommodative and convergence anomalies for age group between 10 and 35 years. We found that AA decreased and NPC receded with age. There was a significant increase in horizontal phoria for near with age. Porcar E, Martinez-Palomera A. Prevalence of general binocular dysfunctions in a population of university students. Optom Vis Sci 1997;74:111-3. Jiménez R, Pérez MA, García JA, González MD. Statistical normal values of visual parameters that characterize binocular function in children. Ophthalmic Physiol Opt 2004;24:528-42. Baker FJ, Gilmartin B. A longitudinal study of vergence adaptation in incipient presbyopia. Ophthalmic Physiol Opt 2003;23:507-11. Scheiman M, Wick B. Clinical Management of Binocular Vision: Heterophoric, Accommodative and Eye Movement Disorders. 2 nd ed. Philadelphia, USA: Lippincott Willians and Wilkins; 2002. p. 3-52. Cohen Y, Segal O, Barkana Y, Lederman R, Zadok D, Pras E, et al. Correlation between asthenopic symptoms and different measurements of convergence and reading comprehension and saccadic fixation eye movements. Optometry 2010;81:28-34. Scheiman M, Gallaway M, Frantz KA, Peters RJ, Hatch S, Cuff M, et al. Nearpoint of convergence: test procedure, target selection, and normative data. Optom Vis Sci 2003;80:214-25. Antona B, Barra F, Barrio A, Gonzalez E, Sanchez I. Repeatability intraexaminer and agreement in amplitude of accommodation measurements. Graefes Arch Clin Exp Ophthalmol 2009;247:121-7. Rainey BB, Schroeder TL, Goss DA, Grosvenor TP. Inter-examiner repeatability of heterophoria tests. Optom Vis Sci 1998;75:719-26. Duane A. Normal values of the accommodation at all ages. JAMA 1912;59:1010-3. Berens C, Sells SB. Experimental studies of fatigue of accommodation. Am J Ophthalmol 1950;33:47-58. Eskridge JB, Amos JF, Bartlett JD. Clinical Procedures in Optometry. Philadelphia. Lippincott; 1991. p. 69-73. Donders FC. In: On the Anomalies of Accommodation and Refraction of the Eye with a Preliminary Essay on Physiological Dioptrics. London: The New Sydenham Society; 1864. p. 28. Hofstetter HW. Useful age-amplitude formula. Optom World 1950;38:42-45. Capobianco NM. The subjective measurement of the near point of convergence and its significance in the diagnosis of convergence insufficiency. Am Orthopt J 1952;2:40-2. Rouse MW, Hyman L, Hussein ME. The Convergence Insufficiency and Reading Study (CIRS) Group. How do you make the diagnosis of convergence insufficiency? Survey results. J Optom Vis Dev 1997;28:91-7. Davies CE. Orthoptic treatment in convergence insufficiency. Can Med Assoc J 1946;55:47-9. Lyon DW, Goss DA, Horner D, Downey JP, Rainey B. Normative data for modified Thorington phorias and prism bar vergences from the Benton-IU study. Optometry 2005;76:593-9. Goss DA, Moyer BJ, Teske MC. A comparision of dissociated phoria test findings with Von graefe phorometry and modified Thorington testing. J Behav Optom 2008;19:145-9.